Jeremiah Horrocks Institute, UCLan, UK. 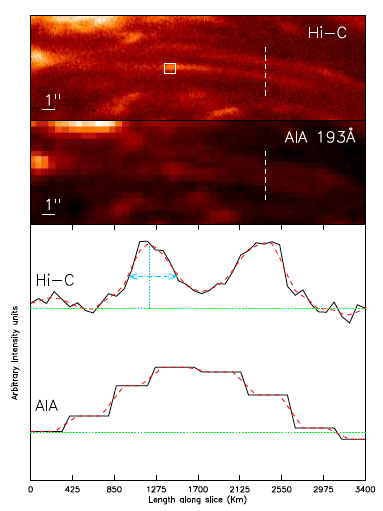 Figure 1: Context image showing the full-disk Sun in SDO/AIA 193A where the red box highlights the full FOV of the Hi-C instrument. The lower image shows an example Hi-C frame where box 1 shows the location of the 'sparkling dots' and box 2 shows the location of the 'anti-parallel' filament flows. The High-resolution Coronal Imager (Hi-C; ) is a new instrument developed by NASA’s Marshall Space Flight Center and partners1 that was launched on a sounding rocket at approximately 18:50 UT on 11 July 2012 from White Sands Missile Range. 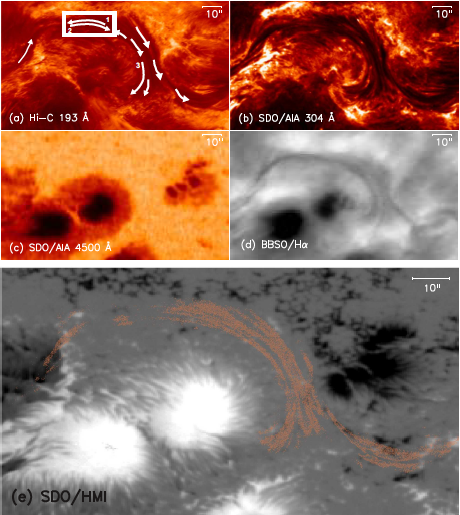 The instrument imaged a large, magnetically complicated active region (AR 11520) at 193A with the highest spatial resolution ever achieved in the EUV wavelength regime. The pixel size of Hi-C is 0.1” giving it a spatial resolution of ~0.3”. Comparing this with the 0.6” pixel size and 1.2” resolution of SDO/AIA , Hi-C offers about four times higher resolution. The cadence of Hi-C was ~5.5 seconds compared to SDO/AIA’s 12 seconds. AR 11520 was imaged by Hi-C for approximately five minutes and resulted in 200 seconds of high quality data for the field-of-view (FOV) (7.1’ x 7.0’) highlighted by the red box in Figure 1. The Hi-C images have already proved to be a rich dataset as AR11520 contains a number of exciting phenomena. Two such examples are explored further here with references to additional work in the conclusion. Research into the mechanisms that create and maintain solar prominences has benefited greatly in recent years from the increased resolution of instrumentation. In particular, Hi-C’s increased temporal and spatial resolution has allowed filament structures to be examined using the most detailed EUV observations to date. Previous observations of plasma motions within filaments using H-alpha have shown that a large number exhibit ‘counter-streaming’ motions  where plasma is observed to move both up/down or east/west along filament strands. Hi-C has provided the first observation of this type of flow in the EUV  and is shown in the movie below. Hi-C 193A movie showing the anti-parallel EUV flows along adjacent filament strands (upper left box) as well as the EUV sparkling dots described below (lower right box). Figure 2 shows the investigation of the width of the filament threads. It can be seen that Hi-C picks out the two filament threads whilst AIA’s higher pixel size results in these distinct features being blended together. The width was found to be 0.8” which explains why AIA is unable to pick out the individual strands. 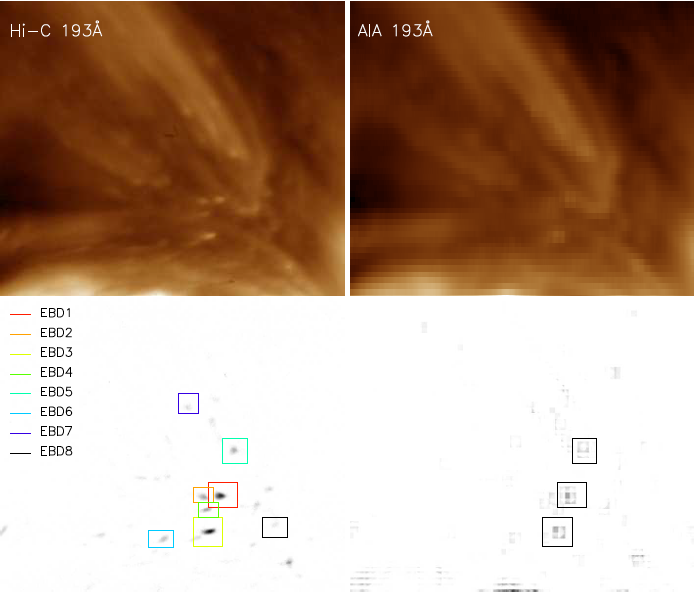 Figure 2: Two top images show the FOV where the anti-parallel flows are observed imaged by Hi-C and SDO/AIA 193A. The intensity in these images was measured along the dashed white lines and plotted in the bottom panel. The context of these flows is investigated further in Figure 3. It can be seen that the filament lies along a polarity inversion line and is also visible in H-alpha. Figure 3a shows the various flows that are observed in and around the filament and illustrates that small-scale flows are commonplace. Based on these observations we suggest that anti-parallel/counter-streaming flows may be ubiquitous in all filaments and the absence of previous observations of this is due to the resolution of current imagers. Figure 3: Anti-parallel filament flows observed in (a) Hi-C, (b) AIA 304A, (c) AIA 4500A, (d) BBSO H-alpha, (e) HMI with Hi-C contours. Hi-C also revealed the existence of short duration, small brightenings sparkling at the edge of the active region (Figure 1, box 1), called EUV Bright Dots (EBDs). EBDs have a characteristic duration of 25 s and a characteristic length of 680 km. These brightenings are not fully resolved by the SDO/AIA instrument at the same wavelength, but can however be identified with respect to the Hi-C location of the EBDs. Figure 4 shows a comparison between Hi-C and AIA 193A at the location of the EUV dots. The top panels show the images while the bottom panels show the filtered intensities which highlight the dots more clearly. Of the eight dots identified by Hi-C, only three were observed by AIA. Furthermore, these identifications are on the scale of ~1 AIA pixel so it is very likely these dots could not be identified by AIA without Hi-C as a guide. 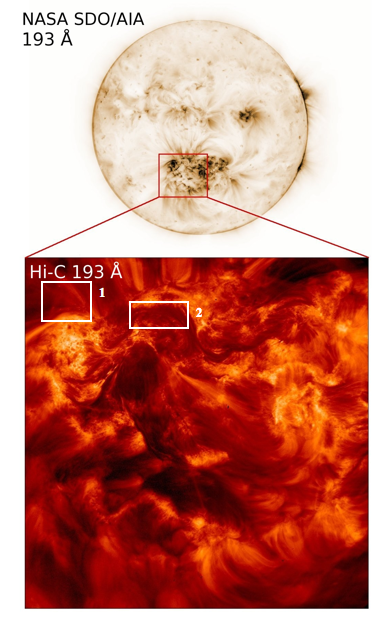 Figure 4: Top row: (left) Hi-C image at 193A, (right) SDO/AIA image at 193A; Bottom row: filtered and integrated intensities during the whole Hi-C time series: (left) Hi-C EBDs, (right) SDO/AIA EBDs. Based on a potential field extrapolation from an SDO/HMI magnetogram (see ), the EBDs appear at the footpoints of the large-scale trans-equatorial coronal loops seen leaving the top of the Hi-C FOV in Figure 1. The Hi-C observations provide the first evidence of small-scale EUV heating events at the base of coronal loops, and are consistent with the nanoflare heating mechanism. Hi-C has provided EUV imager data of unprecedented detail, unveiling a number of interesting features (see e.g., [1, 7, 8, 9]). Due to being launched as a rocket flight the dataset has a number of disadvantages (e.g., partial FOV, small time series), but even so, it has shown a very encouraging first look at the sub-arcsecond EUV corona and will undoubtedly influence the design of future imaging instruments. The observations of both the EUV anti-parallel flows and sparkling dots raises important questions for both structures: are these flows and dots commonplace within in the corona? What do these anti-parallel flows tell us about the mass injection/maintenance in filaments? What contribution do the EUV dots make to the global heating of the corona? Using Hi-C as a guide to exploit the available full-Sun, multi-wavelength SDO/AIA data is certainly the next step while data of Hi-C resolution are still a rarity. 1MSFC/NASA led the mission and partners include the Smithsonian Astrophysical Observatory in Cambridge, Mass. ; Lockheed Martin’s Solar Astrophysical Laboratory in Palo Alto, Calif.; the University of Central Lancashire in Lancashire, England; and the Lebedev Physical Institute of the Russian Academy of Sciences in Moscow.